You are here: Home / Working Here / Meet Our Staff / Can the human brain be mapped? Dr. Roger Hudgins is the Director of Pediatric Neurosurgery at Akron Children’s Hospital. Starting with a $100 million budget commitment in 2014, President Barack Obama has announced a far-reaching new research initiative to better understand the human brain. The effort will require the development of new tools not yet available to neuroscientists with the hope of eventually leading to breakthroughs in treating Alzheimer’s disease, epilepsy, autism, traumatic brain injury, mental illnesses, and other diseases of the brain. Some have compared the initiative to the Human Genome Project. It will be called Brain Research Through Advancing Innovative Neurotechnologies, or BRAIN for short, and will involve both government agencies and private institutions. The news has been greeted with both enthusiasm and skepticism. Is it really possible to map brain circuits in action and show how millions of brain cells interact? Changes in brain chemistry cannot be imaged by current technologies and developing this technology would represent a major paradigm shift. 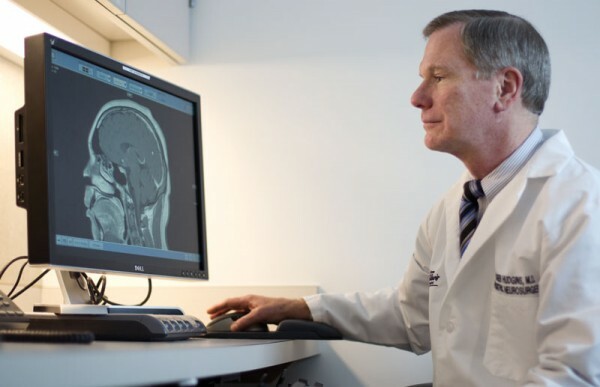 As a pediatric neurosurgeon and director of Akron Children’s NeuroDevelopmental Science Center, Dr. Roger Hudgins knows the brain and sees, on a daily basis, the devastating effect these some of these conditions have on children and their families. Here are some of his thoughts on the proposal and its chances for success. What were your first thoughts when you heard about this proposal? It’s exciting that there is a commitment to explore and understand the workings of the brain. I think, however, that I fall into the skeptical category of observers. In reality, $100 million dollars is a drop in the bucket for a project as vast as trying to map the brain. We don’t have any large-scale technology now that can do this. It will all need to be developed. The cost will probably end up in the hundreds of billions. There is no certainty that knowing the intrinsic structure of the brain will help us understand the diseases that affect the brain, such as Alzheimer’s, Parkinson’s, and mental illness. These are complex pathologies that are more than their anatomy or their neurochemistry. Does a project like this have an endpoint? For the Human Genome Project, the endpoint was clear – knowing all the genes for one human being. For the space program, the endpoint was landing a man on the moon. For the brain, the circuitry is so complex, where do you stop? Major pathways? Neuron to neuron cross talk? Regional connections? All of the neurotransmitters for each pathway and synapse? You don’t really “know it all” until all of this has been studied. Sequencing the human genome was never considered insoluble, just difficult. The technology to do so was already available and the automation of the process just made reaching the finish line that much sooner. The circuitry of the brain is vastly more complex and the technology to map it does not exist at this time. My concern is that the enormous cost will not bear the fruit we would like to see and that other pressing needs (i.e. the national debt, education, the need for infrastructure improvements, unemployment) could be ignored or under supported. Perhaps the more likely and best outcome would be for the federal government to get the ball rolling and hope for private enterprise to continue the work. That happened with the space program and it happened with the Human Genome Project when Craig Venter and his private company Celera did the work quicker and cheaper. If and when this project is accomplished, I will cheer with everyone else. It would be a great feat for mankind. The cost on this project is nothing compared to many of the useless programs that the U.S. government spends money on. It may be a “drop in the bucket” towards research, but it is a start. Tell a parent of a child with neuro problems that it is not worth it and I am sure most will disagree!